Learn why and how to start a forgiveness practice now instead of waiting until your last days. In this episode I share my thoughts about the importance of forgiveness and why you shouldn’t wait until the end of life to start practicing it. I’ve been working on it all my adult life and I can guarantee you it’s a worthwhile endeavor! Download the Forgiveness Tool Kit. For the month of April I’m hosting the 10-day S.M.A.R.T. Decisions Challenge to help you get your advance directives completed in honor of National Healthcare Decisions Day. You’ll be guided step-by-step to figure out what really matters to you so that you can utilize that information as you fill out your living will and healthcare proxy forms. Sign up here. If you are interested in teaching a death and dying class at some point in the future you can download the Teaching Guidelines here! When you sign up you’ll be on the mailing list to learn about the upcoming Work Group and Mastermind for death and dying teachers! Many of my hospice patients have been concerned about practicing forgiveness before they died. I sat with them at their bedsides as they struggled to let go of their anger and bitterness so that they could die in peace. Get the Forgiveness Tool Kit to learn more about strategies for practicing forgiveness on a daily basis so that you will be free of the burden of resentment at the end of life. Sign up for the kit here. Tune in every Monday for a new episode! Leave a review on iTunes if you like this content (it really makes a difference) and go to Patreon.com/eolu if you’d like to become a supporter! How I got joy back into my life after my father’s suicide death. This episode is a follow-up to the 8-part series I presented on my father’s suicide death (episodes 85-92). I will look at the factors involved that helped me eventually find joy in my life once again. You can read the companion blog for this podcast at www.eoluniversityblog.com. You can help support this podcast and the EOLU Interview Series by making a donation at my Patreon page: www.Patreon.com/eolu. This week I would like to thank my newest supporters: Melissa Neeley and Jozie Rabyor. You are awesome! Your support means everything to me. Also last week’s supporter Laurie Dinerstein-Kurs has asked me to promote Death Cafe as a thank-you for her donation. Go to DeathCafe.com to learn more about the movement, download a guideline for starting your own Cafe, or find a Death Cafe near you to attend! Finally as promised, the Patreon donations have reached $50 per month so I am scheduling the first Hospice Happy Hour for Patreon supporters! It will take place on Friday June 23rd at 3 pm Pacific/6 pm Eastern. We’ll “hangout” together, talk about death, offer support to one another, and answer questions. If you are a current donor you’ll receive the call-in information by email. If you are interested you can become a donor too by going to Patreon.com/eolu! Patience. I needed to recognize that grief has its own timing (and its different for everyone.) I had to let me grief follow its own path and unfold in its own way. Stillness. Over time I developed my capacity to experience stillness within through a practice of contemplation and meditation. I discovered that joy arises in the stillness so this step was essential in order for me to ultimately feel joyful again. Facing emotions. For many years I repressed all of my negative emotions about my father’s death because they were too frightening and dark for me. But it was necessary for me to face up to those emotions and embrace them with love in order to make room for joy to return. Allowing change. I learned that I had to allow my grief and pain to change everything about me in order to move through it and discover joy again. My resistance to change kept me stuck in grief for many years and unable to move on. Letting go of expectations. I had to alter my assumptions about how joy would show up in my life and recognize that it would arrive as one tiny droplet at a time. Joy for me now is quiet and serene. Thanks for tuning in to the podcast! 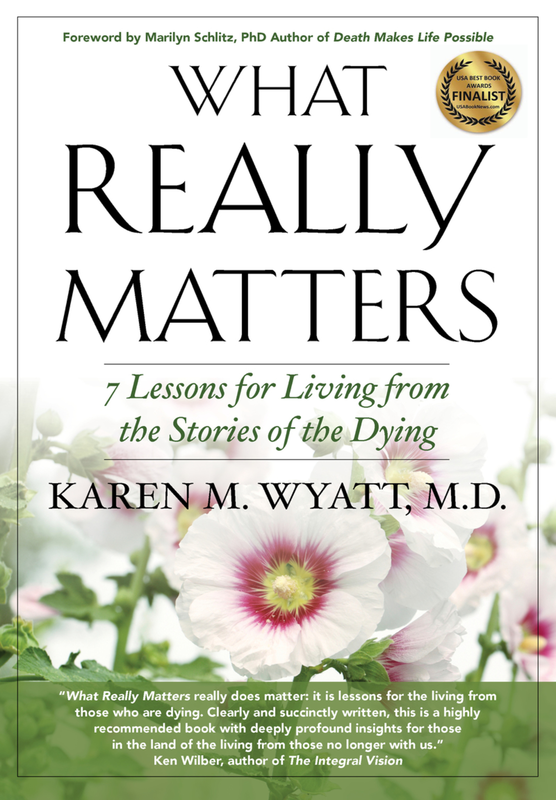 Send me a message or your questions for the Happy Hour at my email address karen@karenwyattmd.com or Tweet me at @spiritualmd!